Basking sharks can be found in temperate waters around the globe and are the world’s second largest living fish reaching an impressive 8 metres (that’s almost the length of two cars). 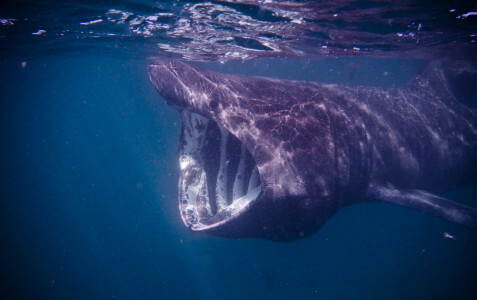 Basking sharks live in temperate (mild temperatures) waters around the world. Basking sharks are filter feeders. This means that they strain suspended matter (solid particles that float in water) and food from water (much like a strainer or sieve used in the kitchen). This is done by enlarging the mouth and passing water over gill rakers. Gill rakers are growths made from cartilage that help the shark feed and prevent loose particles from passing through the gills, helping the shark to breathe. Their diet consists mainly of zooplankton (tiny animals that live near the surface of water), fish eggs, barnacles and shrimp. Basking sharks are peaceful animals. They do not hunt other marine animals or harm humans. Due to their passive temperament, basking sharks have the smallest weight to brain weight ratio of any shark. These sharks were once over exploited for their fins, liver oil and as a source of food for humans as well as feed for livestock. This has led to a decrease in population size and they are now listed as vulnerable. Basking sharks can be found alone, but sometimes are found in small groups or schools of many individuals. Their name comes from the fact that they look like they are basking on the water surface whilst feeding. They have also been the subject of many myths and legends. In the past, fishermen and locals had reported sightings of seeing a sea serpent monster or a globster (an unidentified organic mass), most famously the Stronsay Beast. In actual fact, when a basking shark dies its body decomposes in a way that could resemble a sea monster! This is also known as cryptozoology.